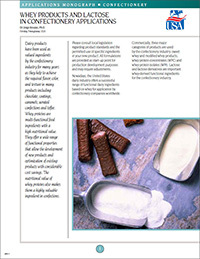 A 12-page monograph providing detailed information about the use of dairy ingredients in chocolate confectionery. Reviews whey products and lactose in compound coatings; and whey products in sugar confectionery, in aerated confectionery, in nutrition bars and in dulce de leche. Includes whey-based ingredients formulations and a Q&A section.